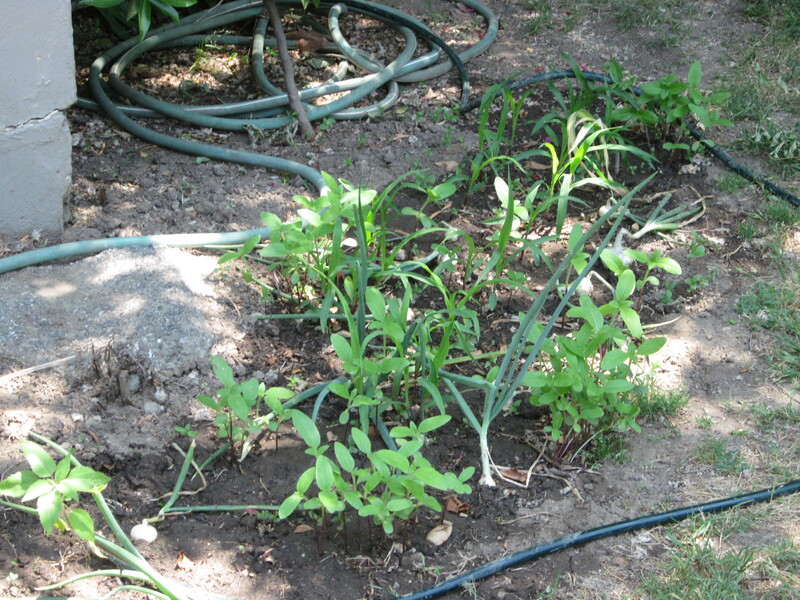 Summer vegetable gardening: Before and after photos! I have been so busy with planting my summer vegetable garden, one plot at a time, that I have not had time to share the results with anyone. But as I’ve been planting since April, I have some great progress photos! This season I’ve been focus on companion planting and making the most of tiny spaces and uneven amounts of sun. 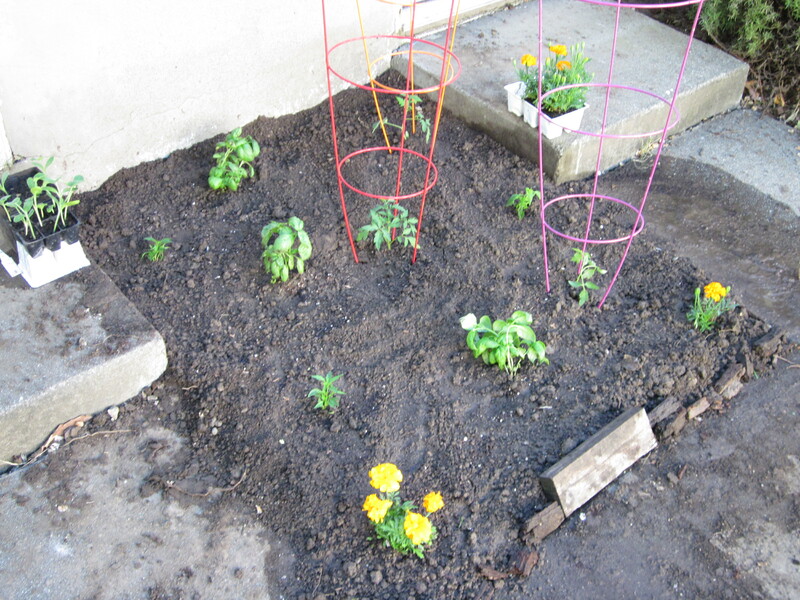 So allow me to introduce you to my 2012 garden. Garden plot, 1 planted April 22: Tomato, basil, pepper. As you can see, the marigolds died off, but the rest of the plants have thrived. 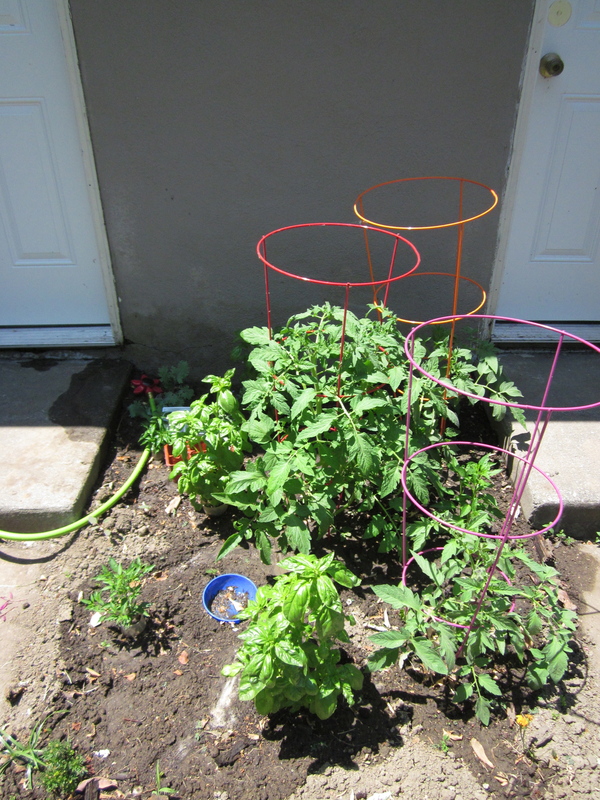 On the right are two shady lady tomatoes, and the tomato in the center is a big beef (I think…). The three basil plants are sweet basil all divided from one plant I bought at Trader Joe’s. The three pepper plants around the edges are all thai hot peppers. I read up on companion planting this spring (see here and here) to determine that these were the best three vegetable starts to put together. This plot is on the side that gets more sun in the morning than the afternoon, but since most of the sunlight casts a shadow toward the north (the side with the marigold 6 pack on the cement), I tried to put the shortest plants on the southern side. Unfortunately I didn’t read up enough on the center variety of tomato/I forgot what it was….its probably going to overshadow the hot pepper on the far right. 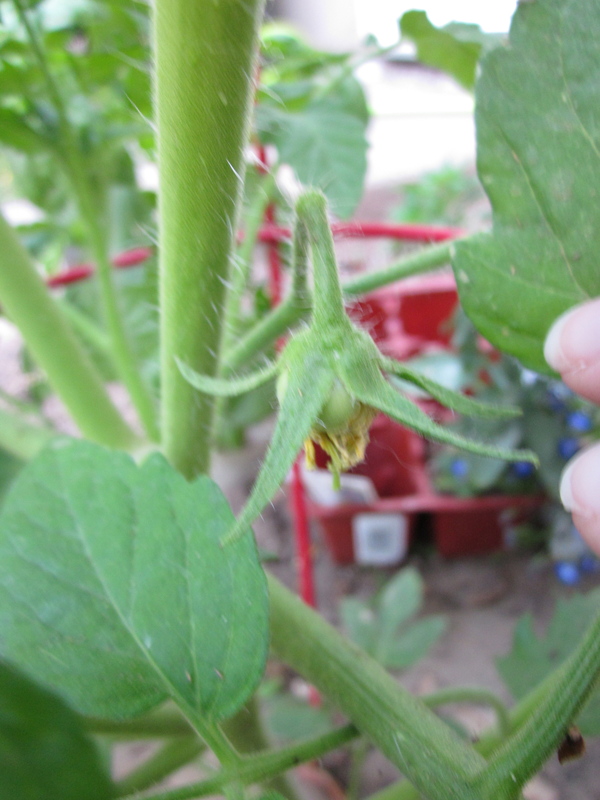 But so far everything is doing just fine.I even have my first green tomato on the big beef! Garden plot 2, planted April 29: corn, beans, squash. This plot has really taken off! But it has also deviated the most from what I thought it would look like. 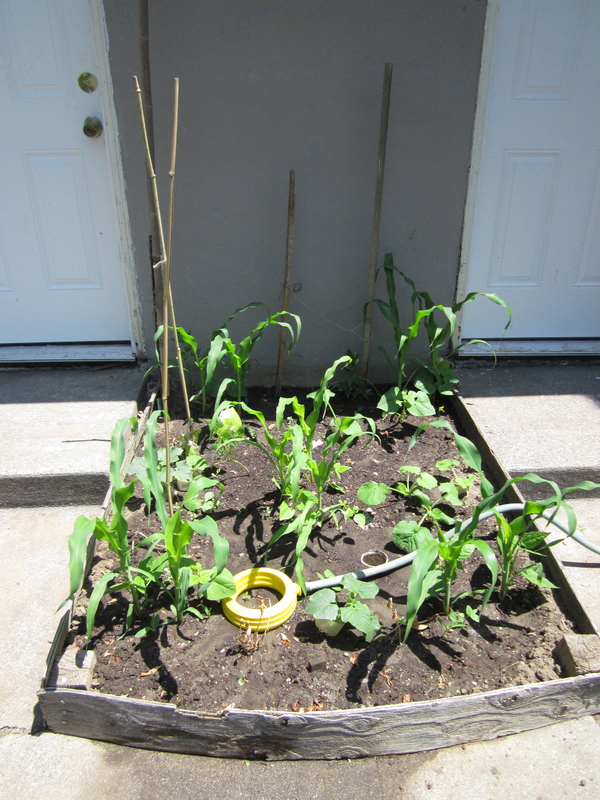 It’s my first really attempt at the oft-mentioned three sisters garden, so called for the corn, beans and squash used together to mimick a number of Native American methods of companion planting (historian note: If you’re interested in the history part, Hurt’s Indian Agriculture in America: Prehistory to the Present would be a good place to start. For a philosophical/more accessible reflection, look at Nabhan’s Enduring Seeds: Native American Agriculture and Wild Plant Preservation). I used corn starts and (mostly) squash and bean seeds for this plot, looking at this website for its diagram and directions for planting. The corn is supposed to be 4 inches tall before the beans and squash seeds go in, so that was well timed. But I also added in some corn seeds later, taken from a random dried ear of corn I saved from a neighbor last year, since I’m worried about having enough corn for pollination. I had to really plant my corn seeds deep, because this is a plot that is west facing and gets a full dose of afternoon sun, and the corn really needs moisute to germinate. 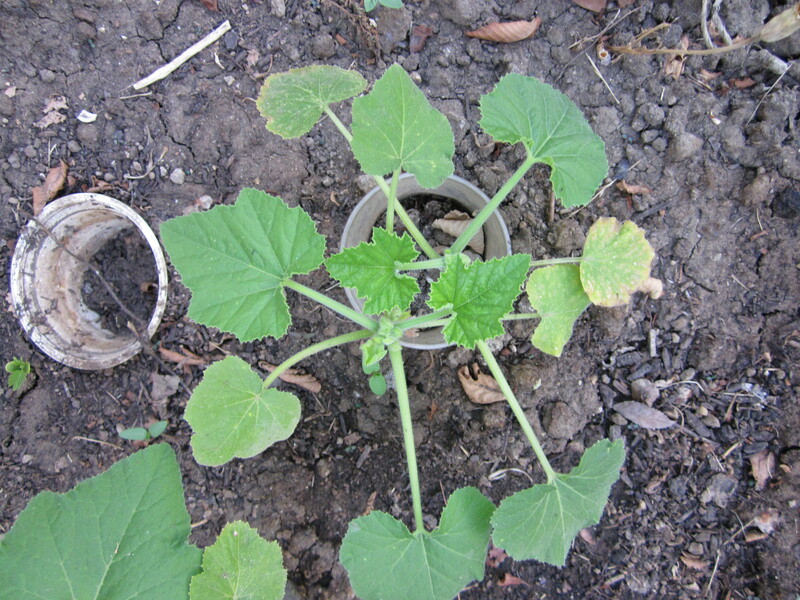 I said “mostly” for the squash seeds because I also planted two of what I was told were two scallop squash seedlings from my neighbor…but I am 95% sure she got them confused with the lemon cucumber seedlings she gave me, since that is what they look like. Oh well. Those are in the front and left groupings. So I’m still not 100% diligent in recording what I plant. 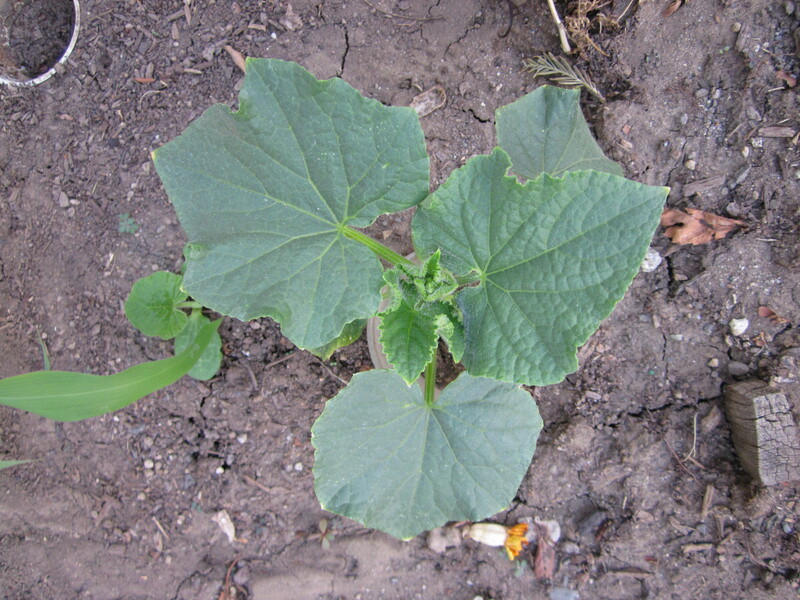 I figure that’s part of the fun of amateur gardening—surprise vegetables! This tiniest plot wasn’t even supposed to be planted at all. It was where I was doing my in ground composting (option 2) this winter and early spring. 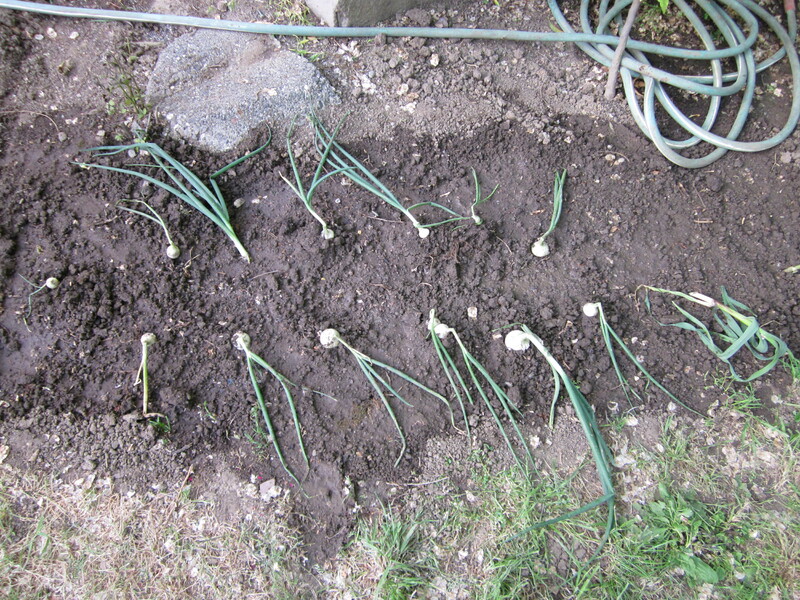 But when I dug up plots 2 and 3 to plant summer vegetables, I couldn’t bear to pull up all of the onions for good. The decent sized ones are drying in my storage unit, but I transplanted all of the small ones to this little scrap of dirt on a whim. I know onions can keep on living in less than ideal situations, which describes this plot—it’s minuscule, its only source of fresh nutrients in years were my food scraps, and it barely gets enough sunlight. Seriously—all of my “after” photos in this post I took around 1 p.m., and most plots are in the sun by that hour, but not this one—it only gets sun from about 2 p.m. to 7 p.m. these days. Six to 8 hours is the ideal. And yet, I held out hope that my onions would survive there and slowly get bigger. Just for good measure, I threw some sunflower seeds and corn seeds in with them, both saved from last summer. 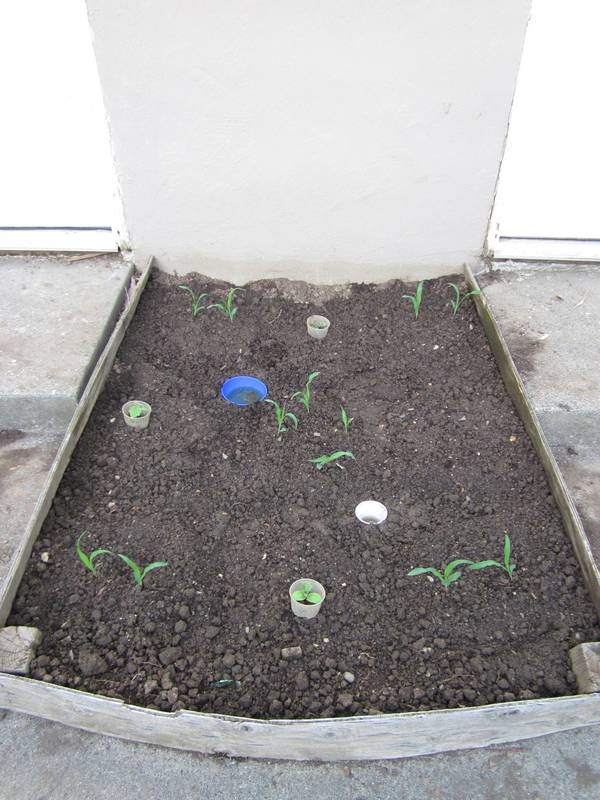 And to my great surprise, the onions and the seeds are doing well! It’s a bit hard to see in this photo, but the corn and the sunflowers all lean about 10 degrees to the west, because that’s the only direction sunlight come from. I may have to stake them when they’re a bit taller so they don’t fall over from their own weight. But there they are, defying the odds. Two nights ago I finished my custom fit raglan sweater! Ok, so I still have to weave in the ends and steam block it, but basically it is done. It’s definitely the best fitting article of knitting I’ve made so far—pics to come! Now, of course, I’m trying to pick a new craft project. Crafts are how I unwind after doing work, so although it is counterintuitive, I need them more when I’m busy than when I’m not. Then suddenly, you gotta catch ’em all. I made these for Keith’s Halloween costume the other year (nerdy costumes I’ve made could be a whole post by themselves). I bought the slightly stretchy dark green fabric from JoAnn’s and used light green felt and black velcro from my sewing stash. 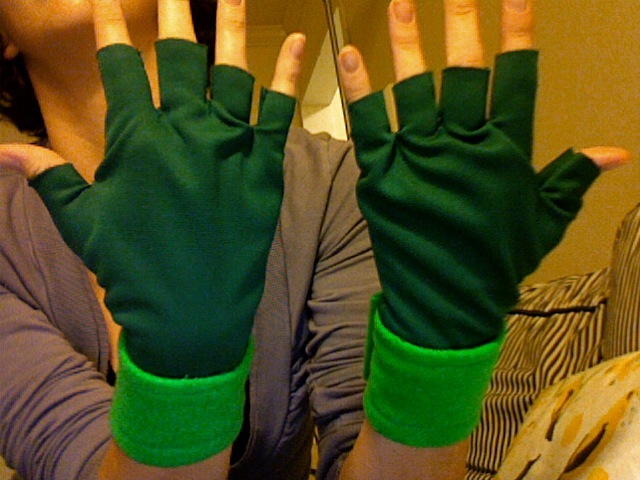 Improviser that I am, I didn’t look at any glove patterns. If I had, I’m pretty sure I would have discovered that its easier to make a separate thumb piece rather than putting in darts in a whole piece. Oh well. 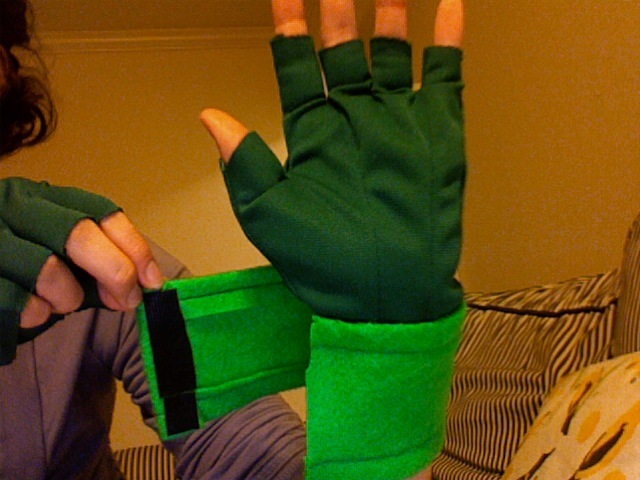 I thought the velcro cuff part was a clever way of using the felt in a way that require it to stretch over the hand. This was one of my first successes knitting with a chart—and it was a chart of the iconic apple logo. 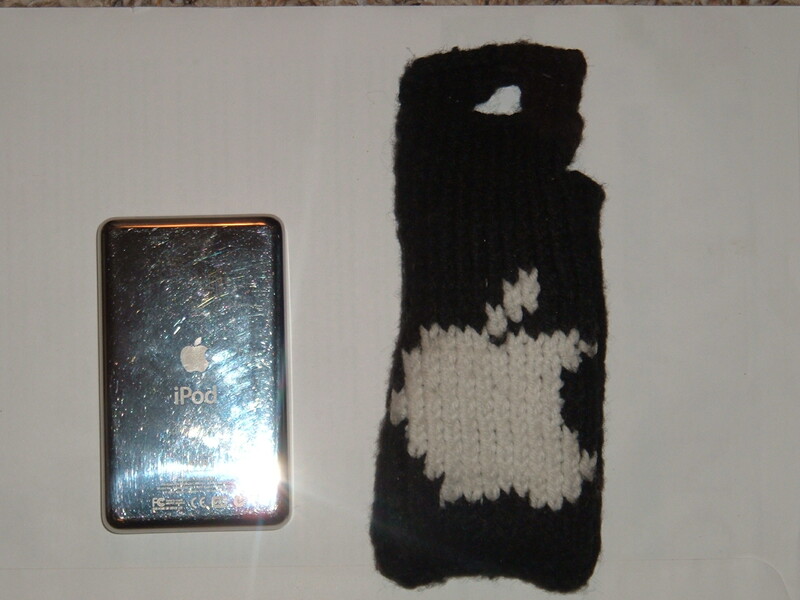 As you may be able to tell by the iPod in the picture, I made this a number of years ago—one of my early geek knits! I wanted to take a better photo but alas, I don’t know where this cozy ended up. It was the perferct size for the older iPods. You can see the button hole at the top of the photo—on the back I added a retro green fabric covered button. 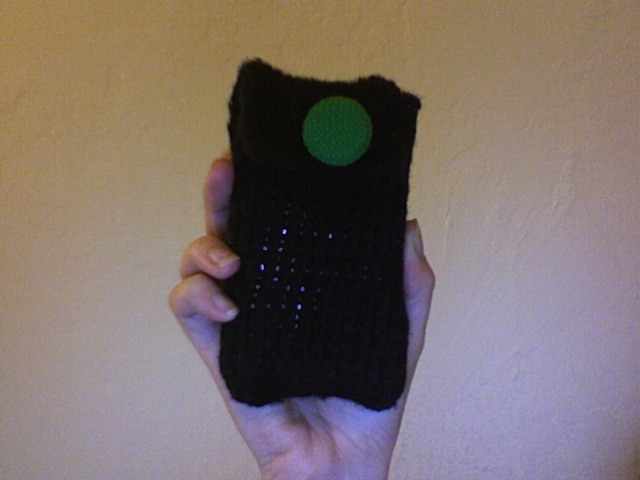 I didn’t use a pattern for the cozy, but I did check my gauge to make sure it would fit. Knit on straight size 1 needles I believe. Pretty sure I learned kitchener stitch (video link) to sew up the sides. So many memories! 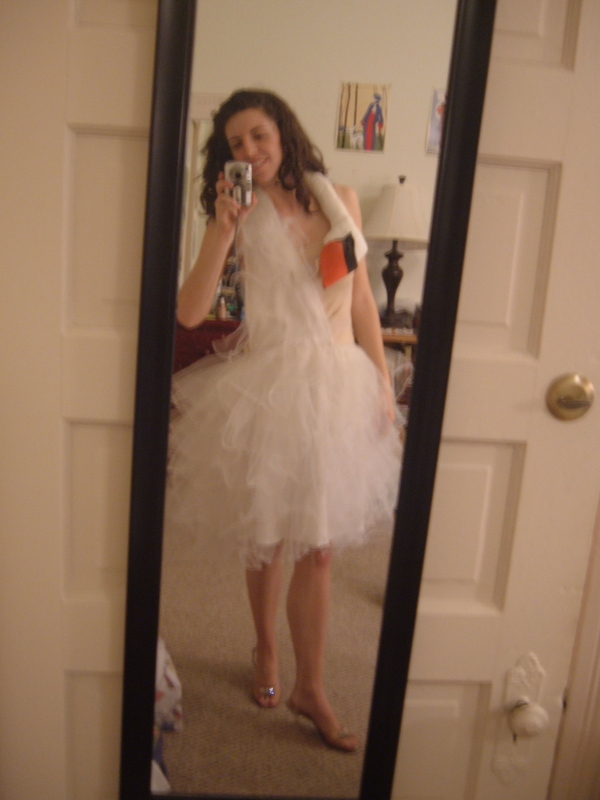 Out of all the costumes I’ve made, this replica of Icelandic singer Bjork’s 2001 Oscars dress is the one I am most proud of. 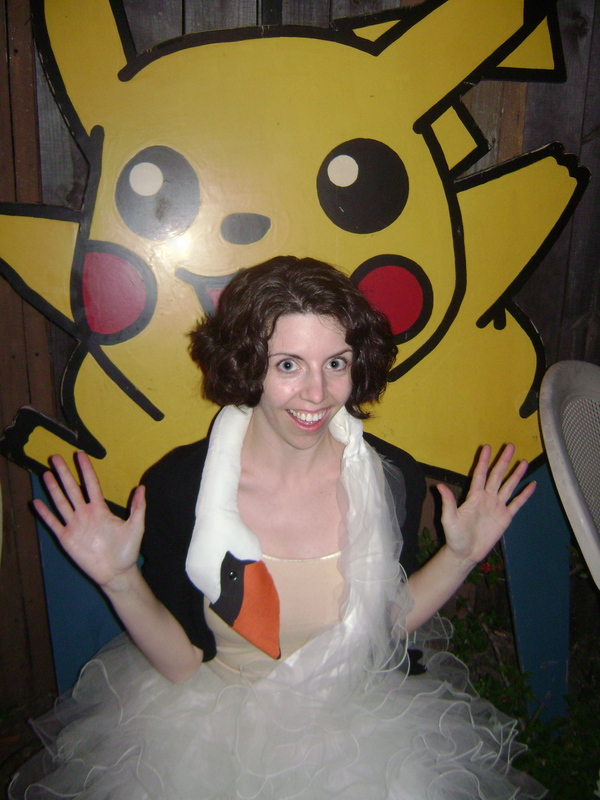 I made this audacious avian outfit from a $10 thrift store dress. I suppose it might have been a wedding dress, though I suspect it was a quinceanera dress. 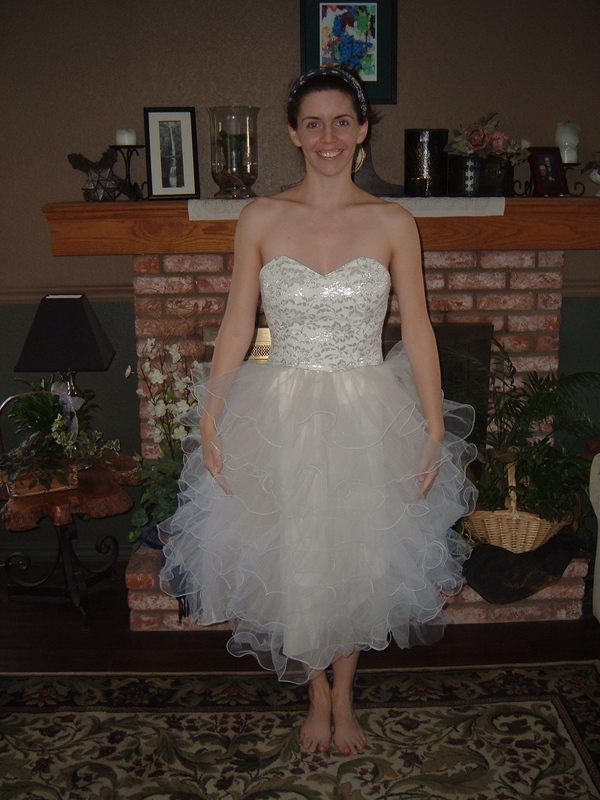 It was strapless and had seven tiered layers of white tulle. Seven! 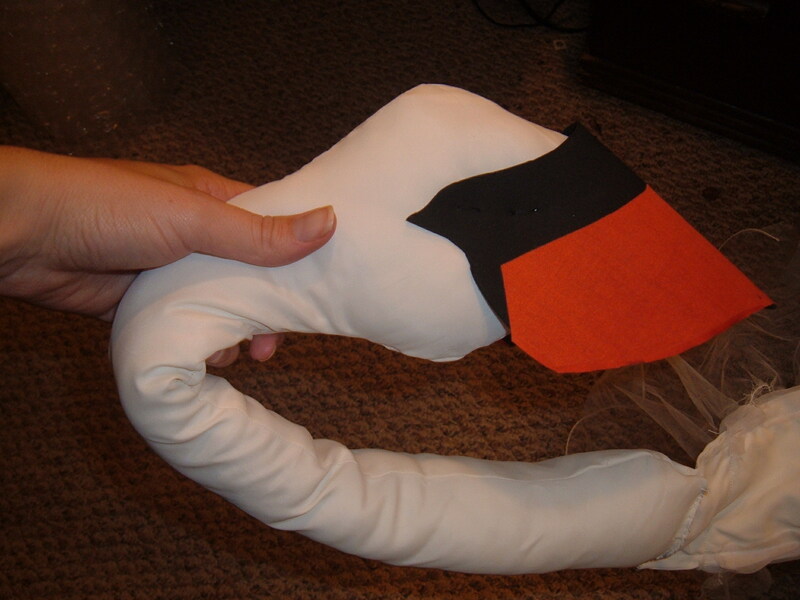 I chopped off the bottom ones and used that along with polyfill, black foam, orange cotton and a black button to fashion the swan top. Finally, I sewed a pale colored camisole that matched my skin tone to the top. My mom helped a lot on this one—there were so many layers to sew through! My newest strain of crafting nerdery has been influence by all things George R.R. Martin —in this case, the HBO series Game of Thones. 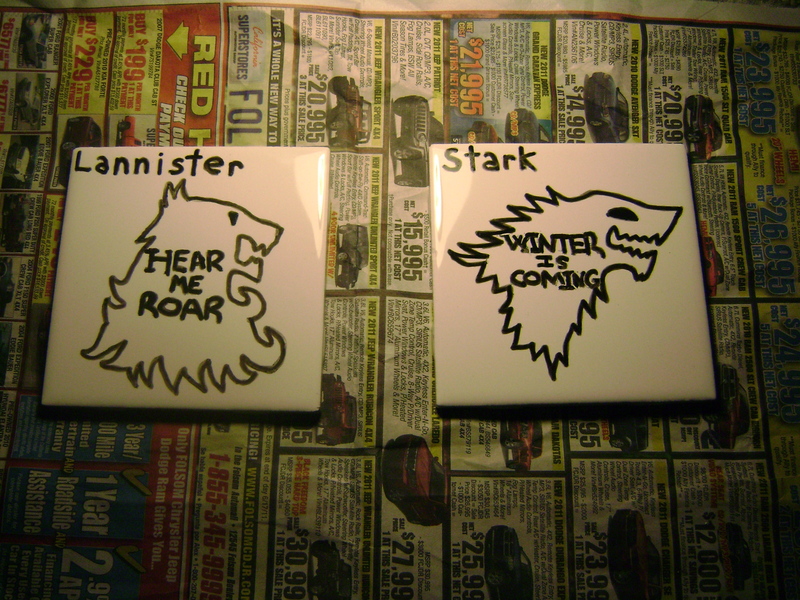 This Christmas I made my brother coasters depicting the sigils and official house words. I used this awesome craftster tutorial to learn how to use the paint pen on ceramic surfaces—heat set them and the paint won’t wash off! Plain white tiles with felt feet on the bottom make nice coasters that don’t scratch tables. I only made two because my paint pen was running out. 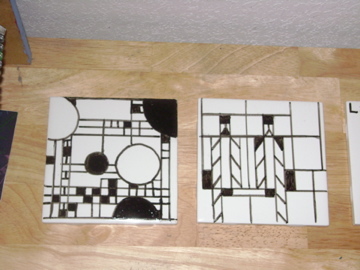 If you’re an architecture nerd, you may like the Frank Lloyd Wright designs I did on coasters for my mom even more. 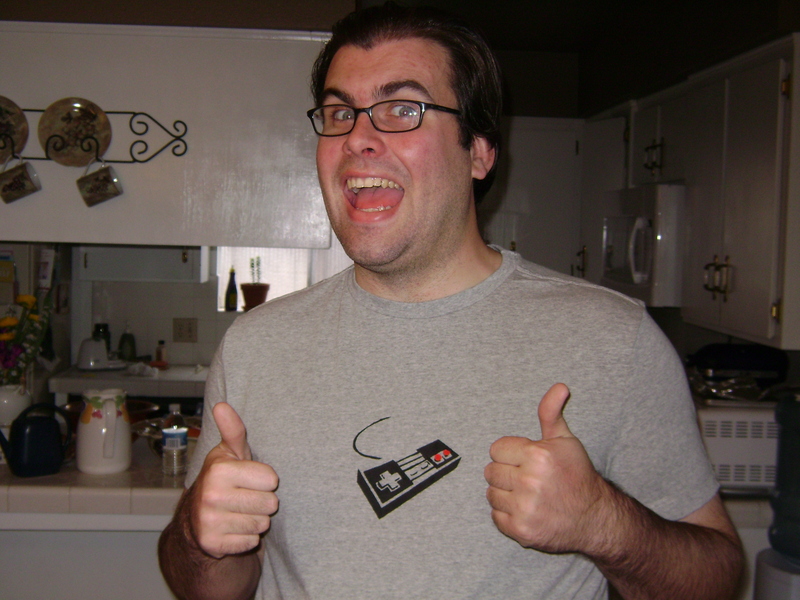 If you thought I would bypass internet meme geekiness, think again! This is one of my favorite modifcations. I used the free pattern for a bunny blanket buddy, but I shortened the ears. 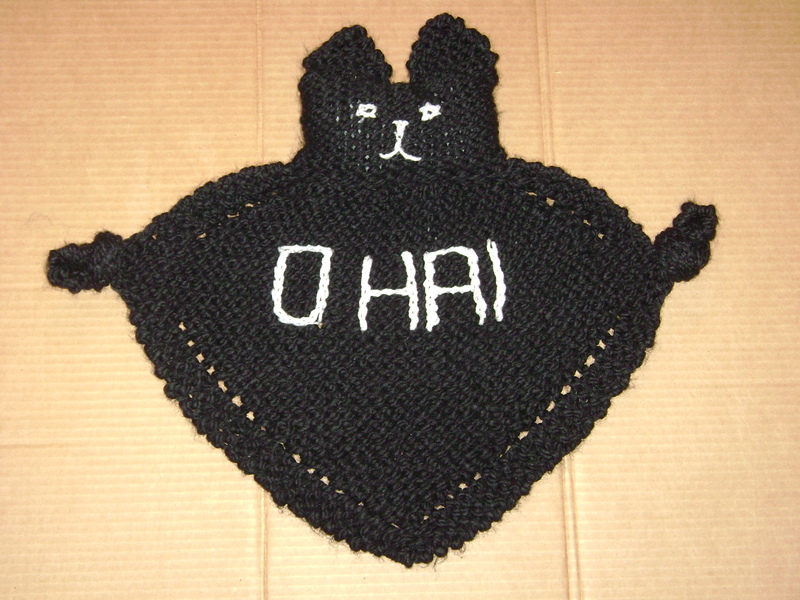 Then I used a crochet hook to write “O HAI” on the front, in a true, I can has cheezburger style. I wish I’d know about duplicate stitch then, because I think it would have lined up better for the words, but on the whole I’m pleased with the results. 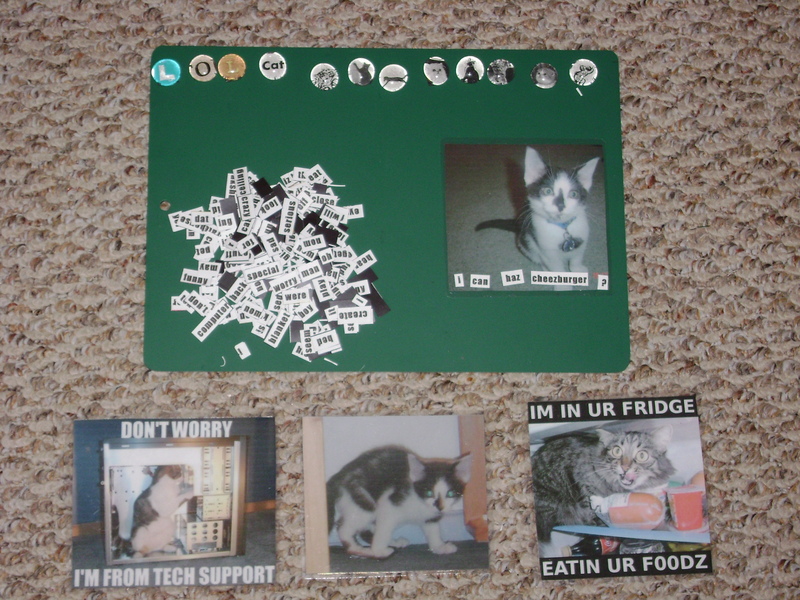 I did this as part of a craft swap, so to go along with the blanket, I made magnetic poetry with the kind of words you see in lolcat images using my printer, thin magnetic strips, and laminated cat photos for refrigerator meme action. I love me some old school video games. And so does my brother. Which I why I made him this shirt. Every so often I get the urge to learn a new craft, and this was one of them. I used the excellent tutorial from stencilry to learn how to mix acrylic paint with fabric medium use it on a disposable freezer paper stencil. Like the coasters, you can heat set the paint so it is washable. I’m pretty sure I downloaded the Nintendo controller image from the same website’s gallery of stencils, but I don’t know what folder it was in so if you want it you’ll have to hunt around. The hardest part of this was doing those red A and B buttons—getting the red paint to fill in those circles evenly was challenge. But then again, so was sharing a Nintendo with my brother back in the 90s! I still have it, by the way, and it works. Another Song of Ice and Fire craft! This one is wearable, but you do so at your own risk. Drogon is one of Daenery’s three dragons. In the books it says that when he was little, he perched on Dany’s shoulder. 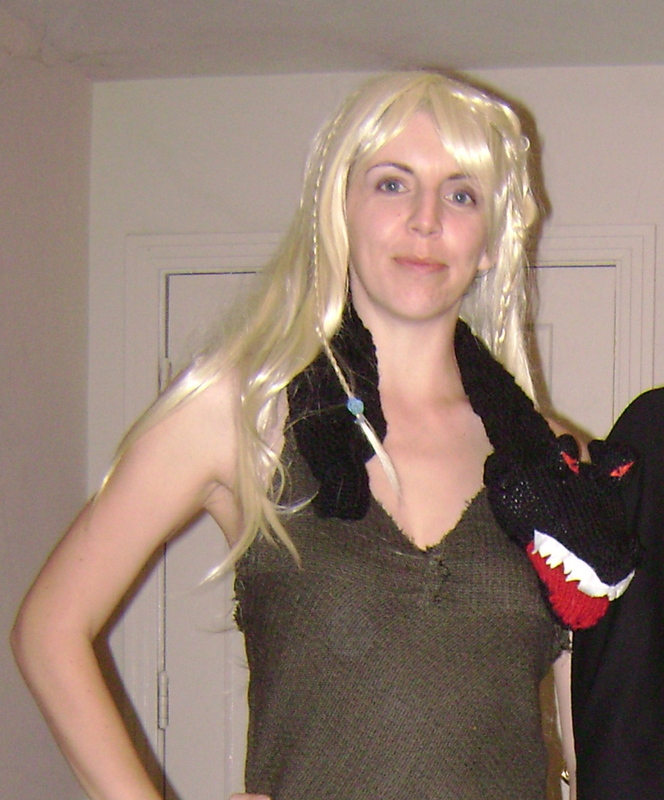 So of course for my Halloween costume, I had to knit a dragon scarf. What a pain in the neck (pun intended). 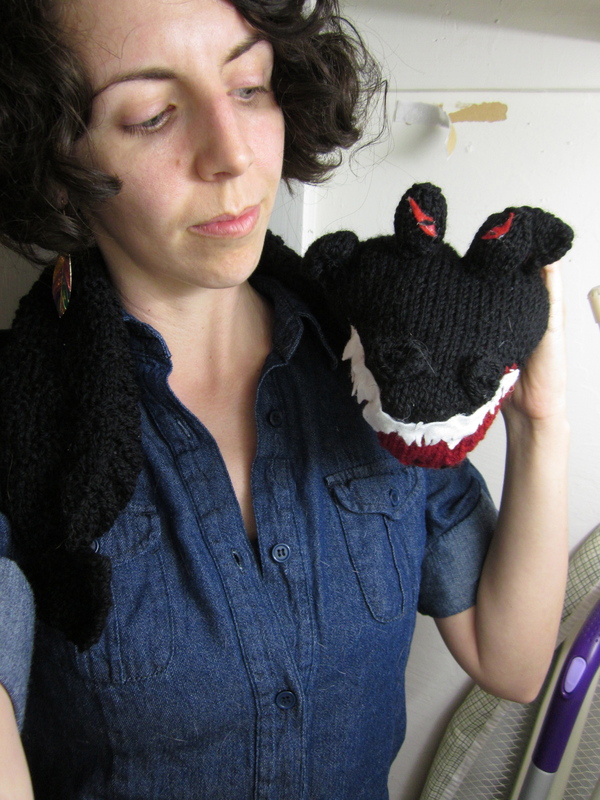 I used this dragon scarf pattern because it was free, even though many ravelry reviewers said it was fiddly. They were right—you knit all the pieces separately and then sew them together. Ugh. 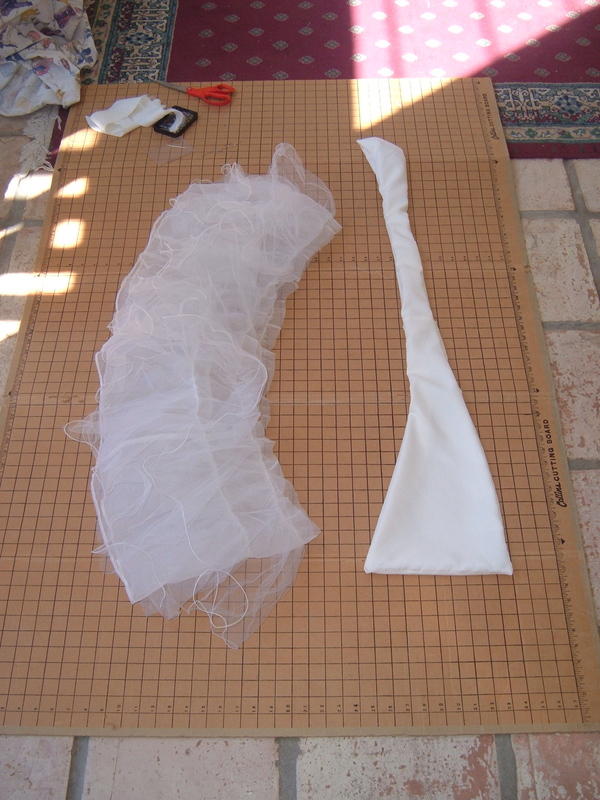 And, since my scarf was black, it was really tricky to see where to sew. Also, all the cool patterning on Drogon’s back gets lost in all that black. However, I am proud of some parts. I used a drop spindle to ply two different color red yarns together to get the exact shade I wanted for his mouth. Also, I had Keith cut the eyes and teeth out of felt for me. The original dragon eyes and mouth look dopey, but this little guy is positively scary. It’s great if you are Daenerys, but if you are a regular person wearing Drogon, I’d keep an eye on him. 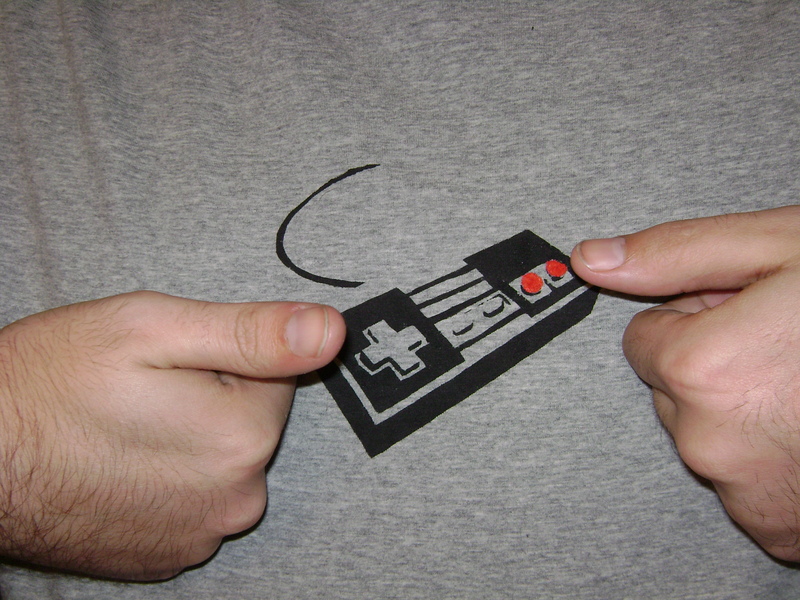 I made this t-shirt at the same time that I made the NES controller stencil. It was a birthday/Christmas gift for my friend Ali. I even made sure to get the font as close as possible to the original, which is a nice touch. 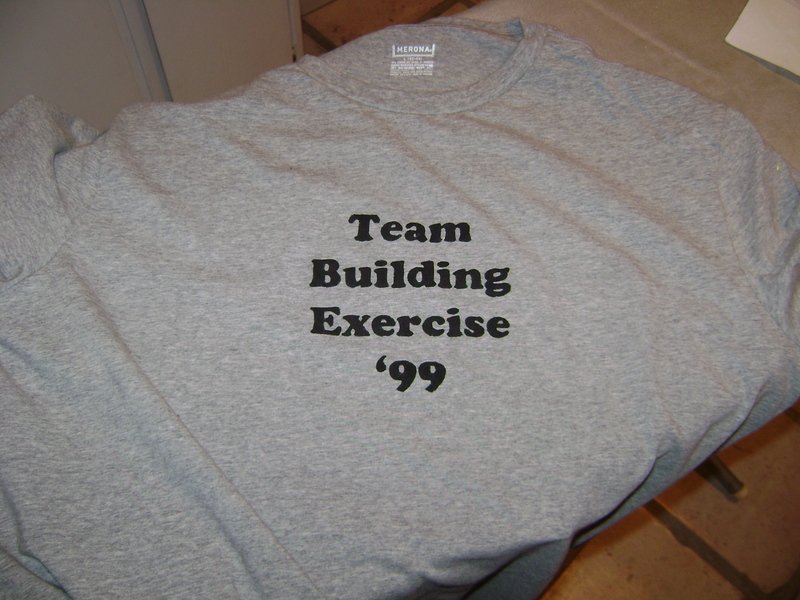 And of course, it’s a baggy gray shirt just like the one in the video. The only thing I didn’t do was put a stain on it like the lyrics described (you can only take these things so far). As I recall, she thought it was pretty sweet. Yet another George R.R. Martin craft? Oh yes it is! This was a graduation gift for Keith, and it was really two gifts in one. First of course, was the craft you see above: a hollowed out book dressed up to look like the latest from the Song of Ice and Fire fantasy series. 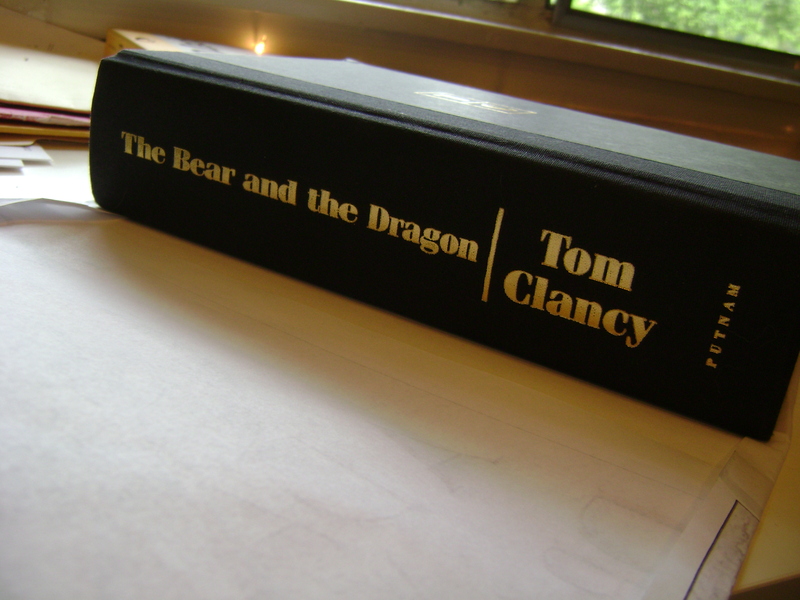 In order to get a large enough hard cover book to make it realistic, I went to the thrift store and bought a Tom Clancy novel when their books were on sale (it was about 50 cents). 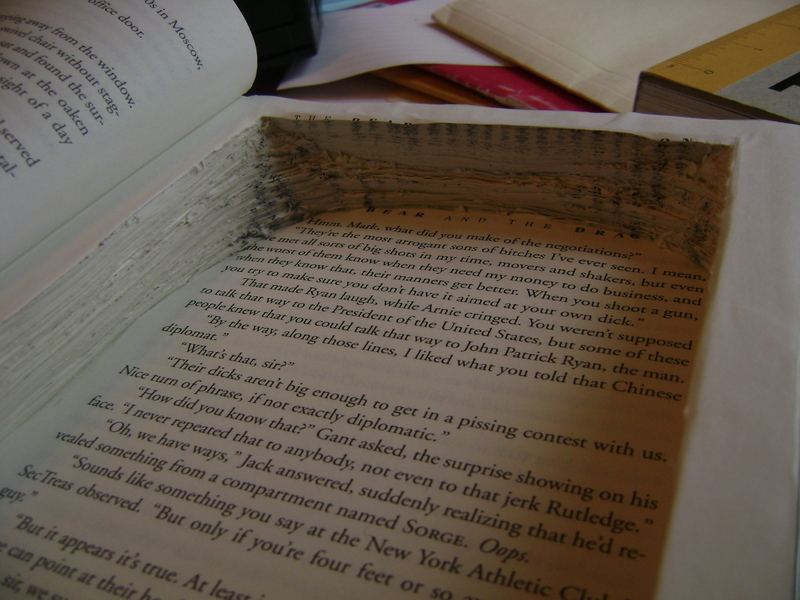 Then I hollowed out the inside using this tutorial as a guide. It wasn’t too bad, but it did take a while with my wimpy exacto knife. 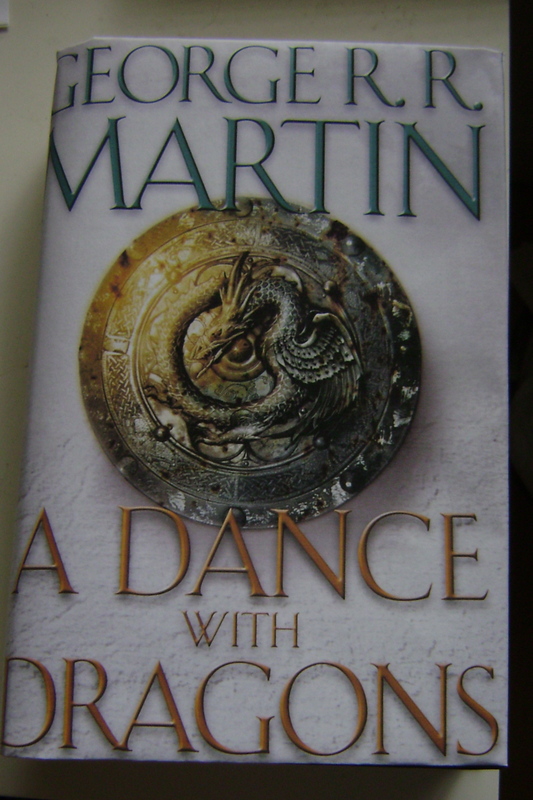 I printed out a copy of the cover for A Dance with Dragons on some printer paper to make the dust jacket—it fit rather well if I do say so myself. 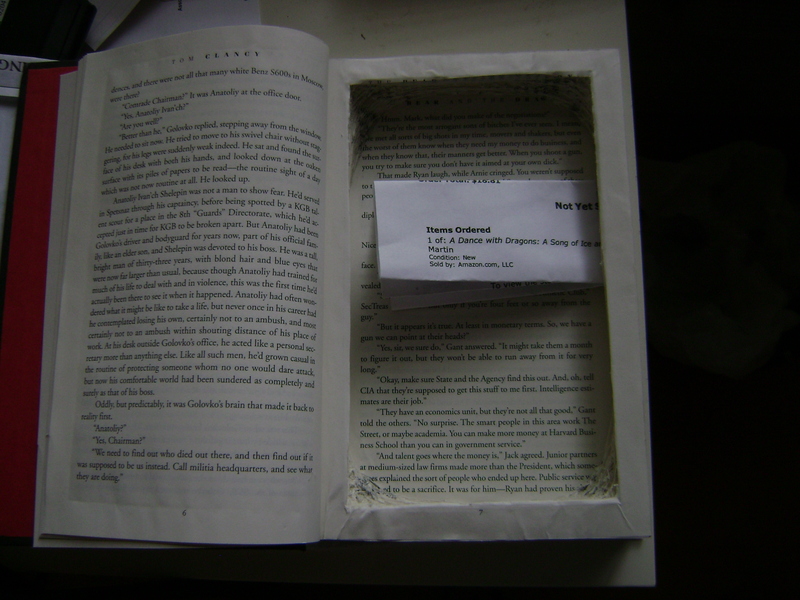 The second part of the gift you can see from the folded paper inside the hollow book—a receipt for the order of the real A Dance With Dragons book. When he graduated, the book was not due out for another month or so. I thought this was a clever way to present a tangible gift when the actual gift happened to be on pre-order. Of all the geeky crafts I’ve made, this one takes the cake—and it literally could pull said cake out of a hot oven. This oven mitt is a pun on Capitan Jean-Luc Picard’s famous phrase “Make it So” from Star Trek: The Next Generation (now streaming on Netflix, fyi). I was a kid when that show was on the air and I totally loved it. When I re-watched some episodes with some friends many years later, we decide that if Captain Picard ever had any kitchen accessories, they would have to say “bake it so” on them. 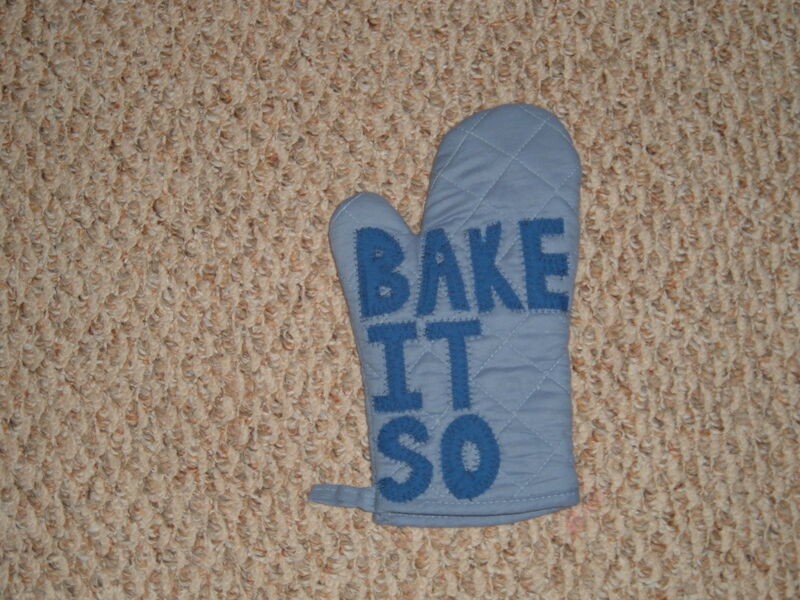 So of course, I had to make an oven mitt with the phrase. 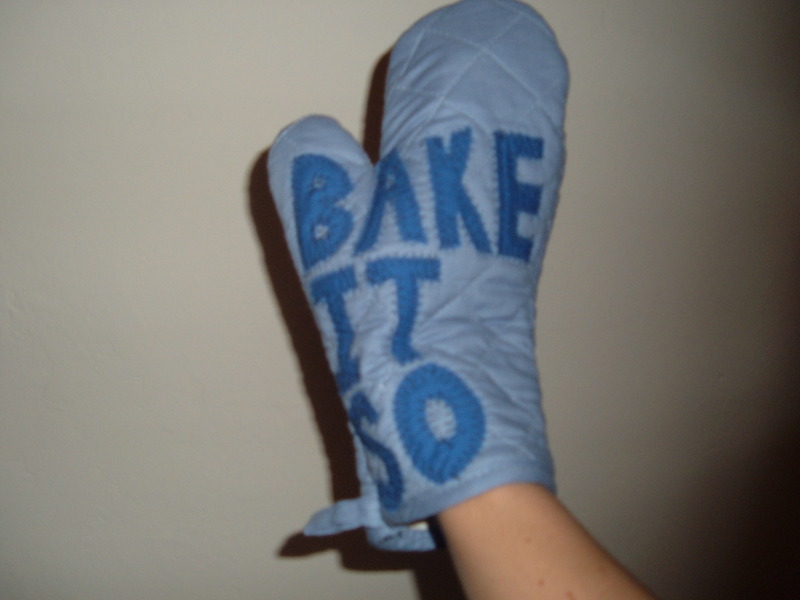 The mitt is exactly what it looks like—dark blue letters cut from scrap material, zig zag stitched onto the front of a light blue oven mitt. I remember that I had to rip the seam of that oven mit from the bottom up to the thumb in order to get it to fit over the arm of the sewing machine. If I had it to do over I would have probably added interfacing to the letters to keep them from fraying or getting out of shape. 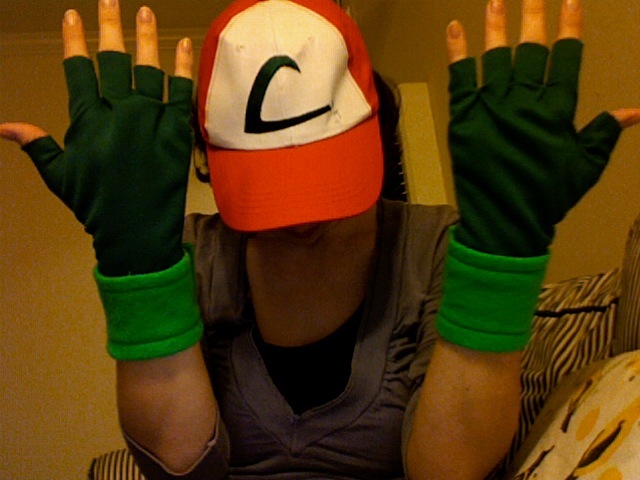 But overall, I am really proud of my extremely nerdy accessory. And that’s the end of the nerdy craft list—now, on to find some new geeky projects!